Here's my week two recap of Project Runway! There are still too many designers to individually discuss looks so I'll just show my top three, bottom three and what I liked and disliked. This week actually made me cry, I won't say why but you will be able to tell if/when you watch(ed) it. I haven't watched it yet (it's still in my DVR). I tried not to look too much because I like to be surprised!!! PS. I gave you an award on my blog today. Come over and get it, you deserve it! it's cool to see new ideas! Ahh! I still need to look this show up on my tv! Thanks for the reminder! I liked the wide legged trousers too, but I hated the purple stripes up the back. What in the WORLD?? 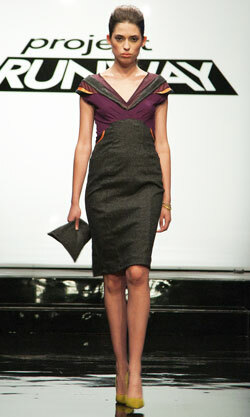 My friend's friend was on project runway a few seasons ago :) Her stuff was really good. I never keep up with it, I'm afraid. I need to get my TV fixed! The jumpsuit and red dress were so fantastic! i'm really surprised that the red dress didn't win, like yes the jumpsuit is very fashion forward but i really think the red dress would have looked amazing on a billboard. LOVE this show, but i usually don't get into it til there's like 6 designers left. By then they weed out all the bad ones. Plus I hate watching from the beginning then getting emotionally attached to someone who is only around for 2 episodes lol. I haven't watched Project Runway yet this season, but it all looks kinda boring so far - what was this challenge? Is anyone standing out from the crowd yet? there are some good pieces there!!! wow. you broke it down!! nice. I've never cared for this show...I'm horrible, I know. I think my favorite is the Christopher_Lg.jpg one in the like column! I also really like the top center one. I did really love the jumsuit- not a fan of the designer's persona- but love her style. Mondo made me sad. :( I hope someone gets him drunk soon so he opens up a little and lets loose. thank you for this. i stopped watching the show some seasons ago, so it's nice to have a recap. i love your likes and your top 3.
i follow you now; feel free to follow me too. Oh jeez I really have been under a rock! I didn't even realize Project Runway started again!! so pretty! and i need to catch up and watch all of those! they look gorgeous! and i definitely agree with you! I cant seem to remember the designer of the red dress's name. But I thought she shouldve won the challenge. Nice I can see many things that seems to work so great!!! Thank you for reminding me about project runway....I'm here for gods sake and I can watch it .....YEAH!!! Hope you're having a wonderful weekend.!!! i reaaallly loved the yellow number by a.j. ah i love project runway! so much talent!...love project runway, their pieces are very elegant and chic.! great post, i love the yellow dress.